The siren wailed electric. Like a banshee passing through the night, its synthetic scream echoed off the claustrophobic buildings as the ambulance sped through the city’s streets. Dogs howled and barked furiously from inside brick townhouses, as this mechanical tempest of pandemonium forcibly wriggled its way into their large sensitive ears. Lunging their bodies at windows, they awaited opportunity for chase, like greyhounds at the racetrack, every muscle fiber twitching in anticipation of the rabbit’s release. The streets were vacant, giving them an eery sensation in that small city, as night fused into morning during that hour where it is neither night nor day, but just a grey haven of morose intentions. Dawn hid, waiting to spread her arms and embrace the world in her soft warm glow, as the darkness along the horizon began to morph in anticipation of the coming light. Not a car on the street, not a person to be seen, even the 7-11 seemed bereft of life. The world was surreal in its serenity as they sped along in the ambulance, tumbling toward chaos. Like phosphorescent butterflies fluttering through the night, the flashing lights illuminated the streets, reflecting off storefront windows as they screamed by. The early morning was a disco ball of red, blue, and white pops of brilliance shimmering through the windshield. These two men, ghosts existing in a world of the dead, a constant state of purgatory, plied the desolate streets fumbling toward controlled pandemonium. For they were the masters of chaos, the composers of destruction, the lords of havoc. The snarling wreck stared at them through the windshield of the ambulance. The unrecognizable vehicle winked at them with one headlight flickering, illuminating their pale faces in flashes. Their unmoved, vacant eyes surveyed the destruction before them, as battery cables arced blue fire of electric sparks underneath the distorted hood. The ground was slick with morning dew, transmission fluid, gasoline, and blood. Each step closer to the patient became a delicate ballet across the soap like surface, as they moved with a careful purpose, seeming sloth-like in their speed. The dull morning glow cast a grey pall over the scene, leaving them all in a liminal hell of carnage and wreckage as they set to work, controlling the metallic maelstrom which silently raged in front of them. A mangled car, a mangled corpse, where organic and machine fuse. Death comes quick, sometimes too quick, but for those unfortunate enough, death lingers in the background, biding his time, observing the suffering of others without any mercy to spare. The night released to dawn, and rays of light peeked over the horizon, basking the tumultuous scene in a warm glow. As if embracing this lost wanderer who was neither dead nor alive, the light of dawn tried to whisk his essence away and strip the contorted lump of flesh of the very life which still persisted. But with a stubborn persistence, life clung to his body refusing to move into the darkness, forcing respirations with a frothy gurgle of bubbling ichor. They set to work, a fruitless effort, knowing death stood concealed behind the curtains in the wings, awaiting his cue on stage. IV and oxygen, bandages and tape. They set to work quickly, but with a hesitance, knowing there was nothing left to this life. It was all just going through the motions for them. The doctor spoke through the ear piece, “go, do everything you can for him.” They sighed, defeated, their shoulders slumped with the weight of dismay, having already predicted the outcome of this catastrophe. Deformed metal was manipulated as firefighters used steel jaws to rent the jagged pieces asunder, fabricating an exit for this unresponsive driver, the rag doll motorist. He was limp like a scarecrow, a set of clothes stuffed with hay and straw, lacking animation, bereft of life, mimicking human. On the stretcher he flopped and jostled with every bump on the pavement it wheeled over, a marionette who’s strings were pulled by some unseen puppeteer. The ambulance is the emergency room these paramedics operate within. The diesel motor purred and hissed, anticipating the foot which would release its demons, allowing it to live, to be free, to snarl down the highway, threatening all others who would stand in its way. The box, a rigid, sterile looking structure. The place where blood flows and IVs penetrate skin, sinking into veins, like pipes into an oil field deep beneath the earth, probing for a thick, dark, viscous fluid to ooze forth from the cavernous depths below. Fluorescent lights overhead cast a pale indifferent light onto the grey surfaces, while the flecks and streaks of blood turned to black ink in the stark light. Wires and tubing snaked from the broken man to outlets on the wall, while bags of clear fluid hung from the ceiling. Machines pumping rubber bladders hissed air with every rhythmic rise and fall, forcing oxygen into his lungs, giving animation to a corpse. He looked automata, unnatural, supported. They made their decision without speaking it, and only a short time later, one of the pale faced paramedics got out to drive, while the other was left alone with the moribund man. The ambulance screamed down the highway, blazing in the morning light. Holding the patient’s hand, a slick, sticky, wet hand, the paramedic’s glove turned red as he soothed and comforted the unresponsive stranger. With a silence and swiftness he moved his hands over the patient’s mouth and nose, and pinching tight, he felt his slick fingers slide across the torn flesh. No reaction, no jolt, no protest of muscles, he lay there flaccid, as he had before. Death entered the compartment and stood next to him, looming over them both, watching in awe of the spectacle unfolding before him. His job was done, and leaving his business card, whispered in the paramedic’s ear to call him, vanishing into the glimmering dayspring. 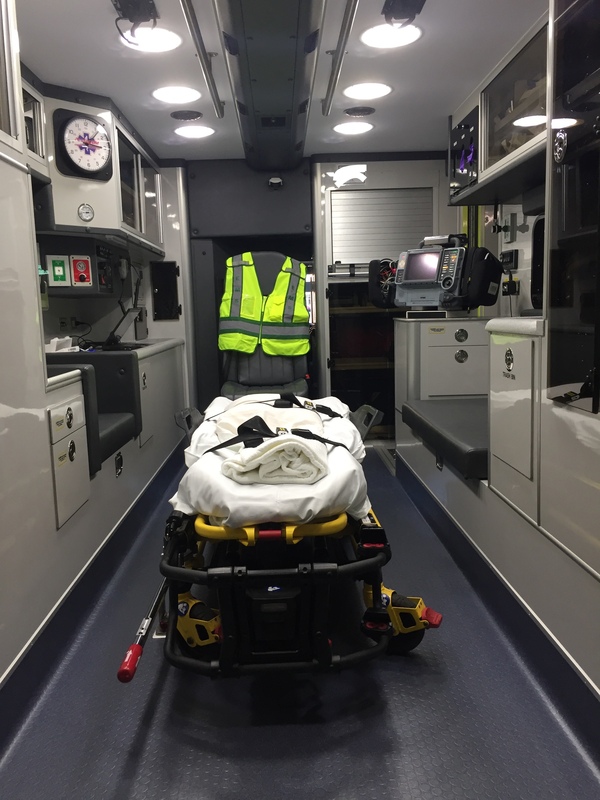 The heart monitor flat, he pulled his hands away, and turned the machine off, the only sound now the humming of the road and the siren wailing, muffled by the walls of the ambulance. They wheeled the corpse in past the creaking mechanical doors of the emergency room, and down the hallway to trauma-one. The doctor who greeted them saw the sheet stained crimson, and knew it was over. Patting the paramedics on the shoulders, his gloved hand gripping their arms, he spoke a very mechanical rehearsed speech which he had given thousands of times before, perfecting this small monologue from sheer repetition. “You did everything you could. Sometimes there is no hope, but I am sure he had the best chance, having the two of you as his paramedics.” Squeezing their shoulders he walked away. They wheeled the stranger out of the emergency room and down to the morgue. In the bowels of the building, where the dingy old tile walls seem to close in and swallow all hope, the patient was moved to the cold steel table in the examiner’s room. Wetting a towel, they unfolded the red sheet from over his head peeling it from his face, and began to wash off the blood smeared around his mouth and nose. When they completed this task, they tossd the towel in the laundry with their stained sheets, and went upstairs where they prepared the stretcher. The box clean, the stretcher back in place, they both climbed in the front, positioning themselves comfortably for the drive. As they pulled away from the building, both staring ahead, a comfortable silence between the two of them, their pallid faces lit by the sun now high above the horizon, they turned onto the highway, the motor screaming an unrelenting howl. The radio blared, and the dispatcher’s voice broke the silence of the cab. Lights on, siren wailing, they plied the road, swerving through relentless traffic. Like a banshee’s wail, the siren a portent of impending doom, they pulled up on scene and found their next victim. This is a candid account of what the life of a paramedic is. Great read.